Today we are spotlighting one of the largest and best wedding dress shops in Roanoke. It's called The Brides House and it's also known as Proms, Pageants & Pretty Things located on Peters Creek Road in Roanoke. We asked them a series of questions about the wedding industry and what they can offer. 1 How long have you been in the wedding business and approximately how many weddings have you done? The Brides House has been in Roanoke since 1960 and at it’s current location since 1987. 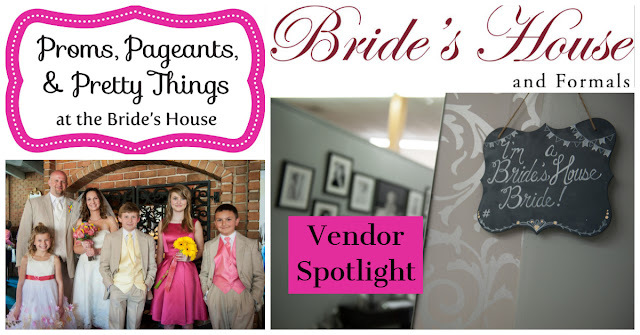 I purchased the business in May of 2012 and renamed the store to Proms Pageants and Pretty Things at the Brides House. We have served literally generations of brides many on 2nd generations of brides and some even starting on the 3rd generation. We are proud to have an ever expanding Brides House Bride family! 2 What sort of questions do couples typically ask when they meet and what do you tell them? Their first concern is, because we are a small family owned boutique, that we will be too expensive, we are able to quickly put that concern to rest. We can dress a bride of any budget here and are proud to have the knowledgeable to help make every wedding day dream a reality. The next concern is what sizes do we have and will they be able to try something on. With the average women in America being a size 14 (which equates to about a size 16 in bridal gowns) and many bridal shops not carrying samples over a size 16 it’s an understandable concern. We understand that this is probably the most important clothing purchase of a woman’s life and being able to try on different styles really seeing the gowns on their body is very important. That is why we carry wedding gowns up to size 30 in stock and ready to try on (we can order up to a size 34 from some of our vendors as well). Holding a dress up in front of you in the mirror won’t cut it for this very important purchase. Brides are also concern about the experience of shopping and the amount of care shown to them during their appointment. That is way we created two private bridal suites in the back of our store and always offer one on one consulting with our brides regardless of their price range. 3 Are there things couples can do before they meet with you to help speed things along? The best thing a bride can do in advance of coming is to have an idea of the feeling or general location of her wedding. Of course you wouldn’t wear a boho style gown in a formal church wedding any more than you would wear a gown with a cathedral train in your outdoor wedding. Having that general direction helps our consultants guide you through the large selection of gowns we have in stock. Other than that, having an open mind when you arrive is the next best thing you can do. What looks great on the model in the Pinterest post and what might look most flattering on your frame could be two different things. 4 What venues do you enjoy working at in the Roanoke area and why? All of our work is completed before the wedding day so we don’t get to be a part of the days festivities. 5 What was the best wedding you worked and why? We don’t have any favorites. 6 Any advice for newly weds looking to get their start in getting married? The best advice I can give a bride is it is her and her fiancés special day. Not her mothers, sisters or mother-in-law to be’s. Make the day be what you have always dreamed of and don’t worry about others opinions of it. Also, please keep in mind, he loves you just the way you are and you don’t need to change anything about yourself before you walk down the aisle. He wants to be with you for you, not your dress size, the color or style of your dress or what style you have your hair in. 7 Do you have any tips or tricks for your part of the wedding industry that you can pass along to couples looking for someone like you? Consider who you bring to your first appointment shopping for your gown. Sometimes too many opinions can be overwhelming. You can always bring the gang back to show them your choice or help you pick from your top choices. Unless you are purchasing a gown from our inventory ordering your gown can take some time, so don’t wait to get shopping. Wedding gowns can take 4 to 6 months to arrive (depending on the designers backlog). Rush shipments are usually available but designers charge extra for that. For best selection, give yourself plenty of time. Sometimes the price isn’t the price. Consider what other hidden expenses might be involved. Do you need a slip or bra to wear that gown? Are alterations a flat rate or based on what you need? What comes with the dress (does steaming after pictures, storage and the dress bag cost extra or perhaps aren’t available at all). 9 Can you describe your price range and the most popular service or products that you offer? We offer gowns at all price points. Our sale gowns start at $99 and our regular inventory starts at $349 (bridesmaids gowns in white or ivory are also a great option for destination or second weddings as well). We also offer payment options, just ask and we can tell you how we can work with you. We also offer discount programs for your bridesmaids, mothers and flower girls and our tuxedo rentals start at $74.95. We offer affordable one stop shopping options for everyone. 1 What is your website and your contact information? What’s the best way to reach you? Or call 540-366-8360, we are happy to book appointments or answer questions through all sources.